Photo by Caitlin's Living Photography. 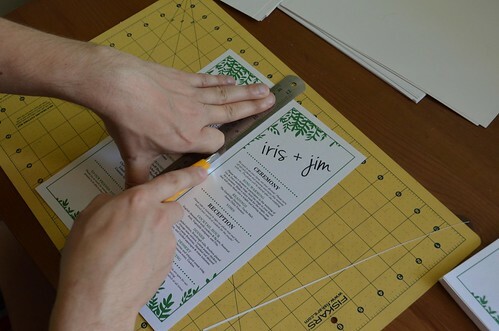 Wedding Programs. 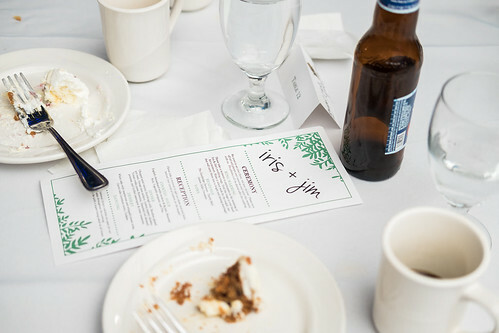 Super not necessary, but sometimes people like to know who's in the wedding party. Or the readings that are being read. So we put the people info on one half-sheet, and the event/food info on the other. As always, inspired by 2+ different layouts by more reputable designers...stretched and contorted to our needs. 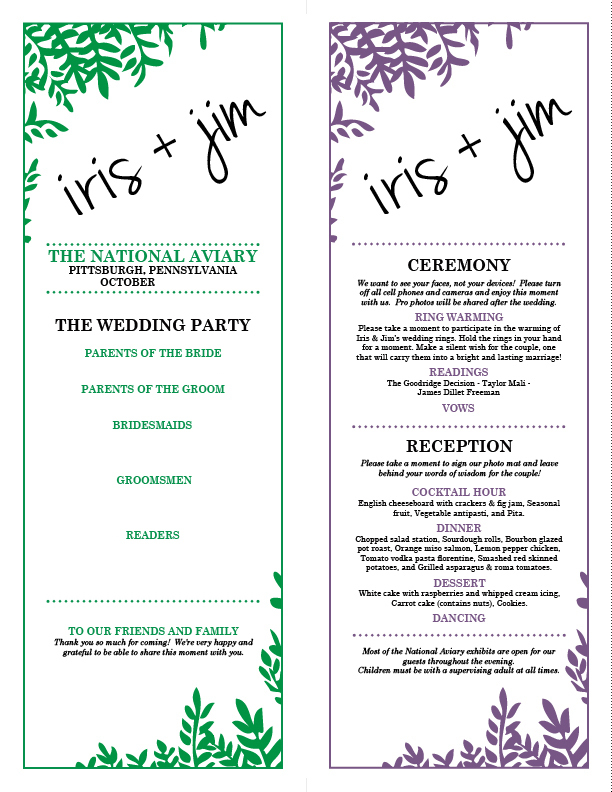 The leaf motifs come from the invitations, and match the rest of the leaf clipart found on other relevant paper products and signage. I do recommend switching up the colors on opposite ends of the spectrum. We did mostly green + black, but really should've done more purple + black to save on yellow ink cartridges. The forgotten costs of printing your own! Rotate your colors. 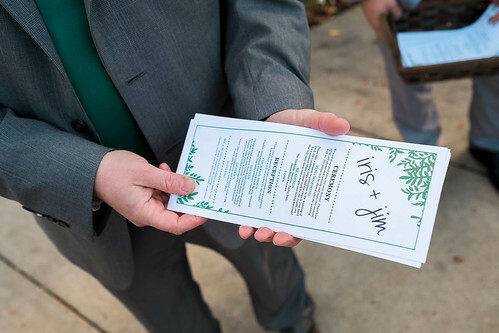 Please take a moment to participate in the warming of I & J's wedding rings. Hold the rings in your hand for a moment. Make a silent wish for the couple, one that will carry them into a bright and lasting marriage! Unity Candles and Blending of Sand ceremonies never resonated with us. I do, however, place a great deal into the sentimentality of objects, so a ring warming ceremony seemed like the most appropriate direction for us. It does involve a little coordination during the ceremony (instructions, someone to start, someone to pick-up the rings), and it does tend to run over. 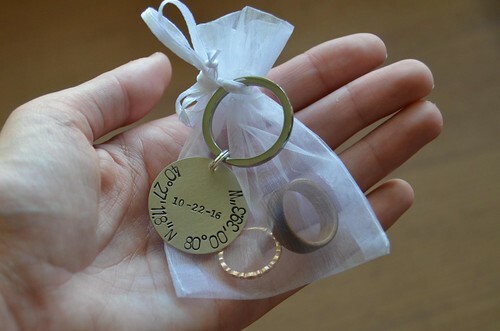 Our rings, held in a little organza bag with a personalized keychain, didn't make it through all 100 of our guests, but did get around 3/4 of the way. Good enough! We want to see your faces, not your devices! Please turn off all cell phones and cameras and enjoy this moment with us. Professional photos will be shared after the wedding. There's some tension among photographers and etiquette gurus about the acceptability of an unplugged ceremony. It's generally considered rude to tell your guests what they can and cannot do (wear/say/be/etc), but at the same time, I've been to weddings with multiple people in the aisles videoing via giant tablets. So I see both sides of this. We went with the rude option, because we just preferred to look at out our friends and family and not see cellphones. However, if your photographer does not have an assistant (i.e., a second camera functioning as a back-up), it might be wise to allow people to take photos just in case something goes wrong. There's also some benefits to letting guests take photos: while our photographers did a lovely job, I don't have any photos of the bunny nibbling foliage along the side of the garden, nor do there appear to be any photos of the glorious sunset happening above our heads at the time. The professional photos had the exposure compensation bumped up a bit, so the lovely pinks and oranges were completely blown out. Had we a collection of amateur photos from the ceremony, I'm pretty sure we'd have that sunset documented. However, some things are better in memory anyways. Basically, it's a toss up. Lose-lose!